Beth Thatcher has spent her entire life in the safe, comfortable world of her family, her friends, and the social outings her father's wealth provides. But Beth is about to leave it all behind to accept a teaching position in the rugged foothills of western Canada. Inspired by her aunt Elizabeth, who went west to teach school several years ago, and gently encouraged by her father, Beth resolves to put her trust in God and bravely face any challenge that comes her way. But the conditions in Coal Valley are even worse than she'd feared. A recent mining accident has left the town grieving and at the mercy of the mining company. The children have had very little prior education, and many of the locals don't even speak English. There isn't even a proper schoolhouse. In addition, Beth's heart is torn between two young men--both Mounties, one a lifelong friend and the other a kind, quiet man who comes to her aid more than once. Despite the many challenges, Beth is determined to make a difference in the rustic frontier town. But when her sister visits from the East, reminding her of all the luxuries she's had to give up, will Beth decide to return to her privileged life as soon as the school year is over? It has been far too long since I have read any book by Janette Oke. I read her entire Love Comes Softly series, Seasons of the Heart series, The Canadian West series, and a couple others of her stand-alone books. However, over the past few years I haven’t read any of them. I had forgotten how much I had loved her books. This story was a refreshing change from the books I have been reading. Beth was neither shy nor submissive to a fault, or so strong and boyish as to lose her femininity. Beth was sweet, but was also courageous. She wanted to teach despite her mother’s protests, without hating her parents. She wanted to have a job, without thinking that homemaking was stupid. She wasn’t a stereotype character. The story itself was a slower pace than many I have read lately. There isn’t any heavy romance or heart-stopping action. It is about the day-to-day struggle of Beth trying to teach in primitive situations, and help a mining town that has been devastated by a recent cave-in. There isn’t much action, yet the story pulled at my heartstrings and kept me turning the pages. The cast of characters was rich and diverse. From the kind hearted, Italian miner, to the kind and wise woman who runs the boarding house, to the children in the class room; the characters were so real. I really enjoyed that the romance, although a part of the story, wasn’t the main element of the book. As much as I love a good romance, it is nice to have some books that are not all about passion and romance. 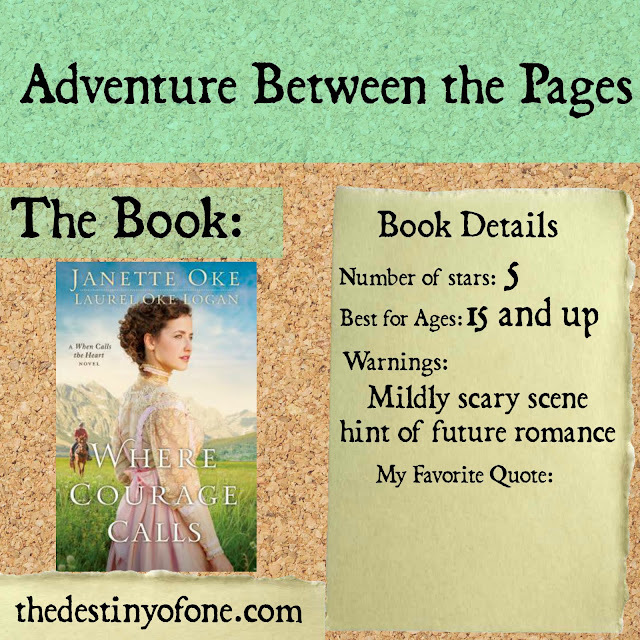 I highly recommend this book for readers who love Jennet Oke, light romance, and stories of courageous women.